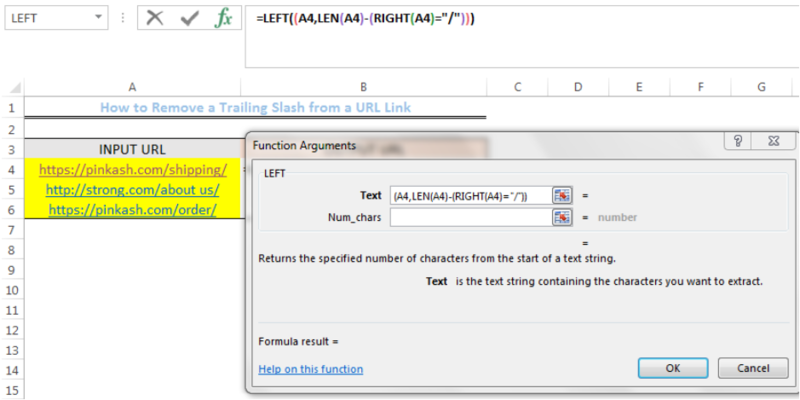 We can remove a trailing slash from a URL LINK by using a combination of LEFT, RIGHT, and LEN functions. This will delete the slash from the URL. We will walk through the steps below to understand how this works. We can also remove the trailing slash by typing the formula below into Cell B4 and then hit the enter button. This formula is used to extract all values to the left in the specified cell. It, however, removes the last character from the URL PROVIDED IT IS A SLASH. Hence, if a URL doesn’t contain a slash at the end, the output will be the same as the input. How do I remove trailing numbers after tenths place in a percentage?